Some people see the springtime as the perfect time of the year to clean out their attic. However, springtime is also prime time for finding amazing deals on commercial real estate in Central Ohio! For a real estate investor, it may seem like a no-brainer. Tax season ended not too long ago; you closed out another year of investments and finances, and it is time to start fresh. Why not start by discovering the best commercial real estate Central Ohio has to offer, and adding to your pool of investments? There is a downside to searching for real estate in Central Ohio during this time of the year, though. Now that the weather is nice, it may seem as though you are not the only one looking… and you are right! However, if you know the tricks of the trade, you can beat your fellow commercial real estate hunters at their game, and come out on top. Remember, finding good real estate deals involves 10% tactic and 90% hustle. So if you want to find the best deal, you need to put in the effort. Get started today with the top ten hustling tips listed below. While some of these tips may seem elementary (read: duh), others take out of-the-box thinking. You would be surprised by how many seasoned commercial real estate investors do not think of some of these tactics. Get ahead of the curve! Scour the Internet for listings. Check out MLS.com, LoopNet.com, Realtor.com, PropertyShark.com, 42Floors.com, RealMassive.com, CREXi.com, Brevitas.com, Rofo.com, and CommercialCafe.com. Even Craigslist and eBay auctions may surprise you. Become active on social media. Real estate brokers often post available properties. People in your network may do the same, especially if you’re following real estate professionals and other investors. There are also tons of networking opportunities for investors. Create an account and network on LinkedIn, in addition to the real estate social networking sites, BiggerPockets.com (in the marketplace or forum) and ActiveRain.com. Make the most of your local network. Believe it or not, there are many professional associations where investors can gather offline. Try Meetup.com, Central Ohio Real Estate Entrepreneurs (COREE), EventBrite, and LinkedIn.com and BiggerPockets.com even offers real estate networking groups that meet in-person in Central Ohio. And if you’re looking for commercial property for sale in Columbus, Ohio, reach out to Columbus Property Investors Association (CPIA). Post your own classified ad. Doesn’t it feel like all you see are classified ads about homes and commercial properties for sale? Why wait for the right ad to come to you? Create an ad with a catchy title, stating that you are looking to buy. That might gain some attention. Start an outreach campaign. Create a list of commercial real estate companies in Central Ohio. Gather the email addresses of brokers, then send out an email asking them to be on the lookout for you. You need an army of commercial real estate brokers to target your ideal real estate in Central Ohio. Hit the streets. Drive through your ideal neighborhoods and office parks in Central Ohio. Commercial real estate listings are not always listed in the newspaper or online; they may come in the form of a sign in front of a property. Seek out foreclosures. This means you may need to form a relationship with banks, auction owners, and sheriff sales. Contact a property wholesaler. A wholesaler will go out and find a good deal on a property themselves; they’ll put that property under contract, then sell that contract to you for a profit. If you’re short on time, this could be the ideal situation for you. However, if you go this route, make sure you find a reputable commercial real estate wholesaler. Target rental property landlords. Call independently-managed rental properties and offer to buy the property, instead of renting it. If you make the right offer, perhaps they’ll consider. Managing rental properties is not for everyone, but, hey, maybe becoming a property manager is for you! Create your own platform. Build a Central Ohio real estate investor website, forum, or blog. Then spread the work on social media and through in-person networking. If this is your niche, why not let the world know that you are looking? If you are willing to put in the hard work and hustle, you’ll beat your competition to the punch. While other investors are looking for shortcuts, you will be sprinting to real estate ownership. Rather Hire a Broker to Find the Best Deals on Commercial Real Estate in Central Ohio? 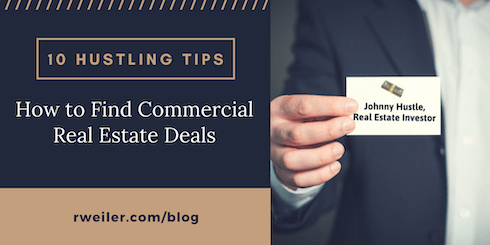 If you want to get a good deal but don’t have the time to look, find a commercial real estate broker. The Robert Weiler Company provides unrivaled commercial real estate brokerage services throughout Central Ohio. Did you know that our commercial real estate professionals could also assist you with a suite of CRE needs, besides brokerage? Our expertise also ranges from conducting a thorough property search in Central Ohio, to commercial real estate valuation, as well as real estate development, and even property management. Backed by 80 years in the Central Ohio real estate market, we have a deep acumen of the local market for all commercial property types. Our long history of real estate success will give you a leg up on your competition. Call us today and find out how you can leverage our CRE brokerage expertise to obtain the best deal possible on commercial real estate in Central Ohio: 614-221-4286.